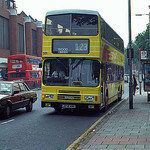 I would be very surprised if TFL don't go ahead with proposed changes to routes 4 and 171. If you merge the 1 & 168, it would become very unreliable - long routes like that nowadays simply don't work, apart from certain exceptions, mainly due to increasing congestion. The 1 being added to another route is quite a nice idea actually as being the number one route it's a rather sorry little route thou busy on the unique section along Grange Road and Southwark Park Road. Knowing tfl they would call the merged route 168, thereby getting rid of 1! There may not be sufficient stand spaces available for the 76 at St Paul's and the 87 at Whitehall. I think the best solution would be to extend a few routes slightly to fully replace the proposes shortened 11. The 311 could then take the 11 number. In this case, the 91 could be extended to Victoria via Westminster. Then between the 6, 9 and 87 - one route would take the 91's stand at Trafalgar Square, one route would use the RV1's Covent Garden stand, and one route extended via the 11 to Liverpool Street. The 172 could then be curtailed to Waterloo, using stand space from the 4 or 341. I agree that the 91 should be extended beyond Trafalgar Square, almost empty buses sit in the traffic jam towards Trafalgar Square on the Strand and most people want to go further. It may as well run through to Victoria replacing the proposed shortened route 11. 6 will duplicate route 9 between Hyde Park Corner and Aldwych once route 9 is diverted to original routeing via Trafalgar Square. Can’t see that lasting. 6 to terminate at Trafalgar Square and 9 extended to Liverpool Street. Either 87 or 172 could run to Holborn, using 171 stand and other to use RV1 stand at Aldwych. It’s only a good idea if it runs reliably and the problem is, you risk reliability by tacking it onto something else - nostalgia needs to be separated from practically. By extending the 91 as some sort of partial replacement for the 11, you are breaking links across Central London further limiting the ability to cross from one side to the other for people who are unable to use the Underground for a number of reasons. Furthermore, 91’s currently sit in heavy traffic on the Strand trying to reach Trafalgar Square so why sit through more along Victoria Street & around Parliament Square & Whitehall. The 3’s stand becomes empty when it takes the 53’s stand at Whitehall. No it won't, the Central London Bus Consultation quite clearly states that the 3 is being cut back to Whitehall to free up its current stand for the 22. As I've said before highway engineering has phases as to what is "in fashion" and what isn't. They seem to spend a lot of time doing things and later undoing them and the redoing them again. There has always been a political / lobbying aspect behind these changes. It is rarely anything to do with a balanced assessment of overall transport *needs* and how to achieve an appropriate balance. Sadly "balance" is always defined by personal prejudices as to how individuals believe they should be allowed to travel without recognising the needs of others. What we are seeing now is a "fad" towards lowering speed and reducing road space and forcing people on to main roads only. Unfortunately it has gone so far that it is also making bus services less effective / less efficient which is a frankly ridiculous outcome.